2013 was the year of the cryptocurrency. From the (in)famous Bitcoin, to the silly, meme-inspired Dogecoin, everyone just seemed bent on jumping on the virtual currency bandwagon. Bitcoin, unarguably the most popular cryptocurrency today, is now being used by businesses of all kinds, from large corporations to neighborhood mom-and-pop stores. Despite the various setbacks that have plagued the Bitcoin community at the start of 2014, the cryptocurrency still prevailed. Is value today is stable at around the $500 to $600 range. Bitcoin is easy-to-use and convenient. It’s easy to see why a lot of businesses have started accepting bitcoins adopting it as a valid payment option for transactions. In light of this phenomenon, there are now “ATM” devices that can provide people with Bitcoins with just a simple click of a button. What is a bitcoin ATM? 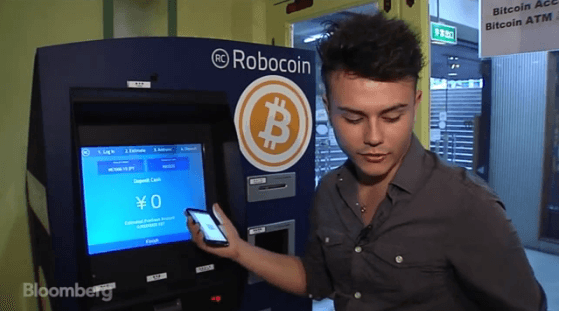 A Bitcoin ATM is a machine that allows people to buy Bitcoins with hard cash. Some machines allow selling of Bitcoins for money, but these kind of machines are often hard to come by. On October 29, 2013, Waves Coffee Shop in Vancouver, Canada, opened the world’s first Bitcoin exchange machine. The device is often comprised of a scanner, a cash dispensary, and a computer to manage the transactions. How to Use Bitcoin ATM Machines? How to Use a Bitcoin ATM? Though there are a lot of Bitcoin ATM manufacturers today, their machines follow a basic operational process. Step 1: Open the QR code for your Bitcoin wallet on a smartphone. You can get a bitcoin wallet from Coinbase if you don’t already have one! Don’t forget to download Coinbase’s app for iPhone or Android from the AppStore or GooglePlay. Step 2: Then run the QR code under the bitcoin ATM machine’s scanner. Step 3: Enters the amount of cash to be exchanged for Bitcoins. Step 4: Waits for the machine to process the transaction and give out a confirmation. Step 5: Check your bitcoin wallet to see if the Bitcoins transaction is processed! Bitcoin ATM machines are very intuitive to use. While there are still not that much Bitcoin ATM machines going around, it’s not that hard to imagine that we will see more of these machines in the near future. Informative and helpful guide about bitcoin ATM machines.I want to get bitcoins through ATM, but I have never used Atm for this purpose. The information that you provide is very useful for me. Thanks! !